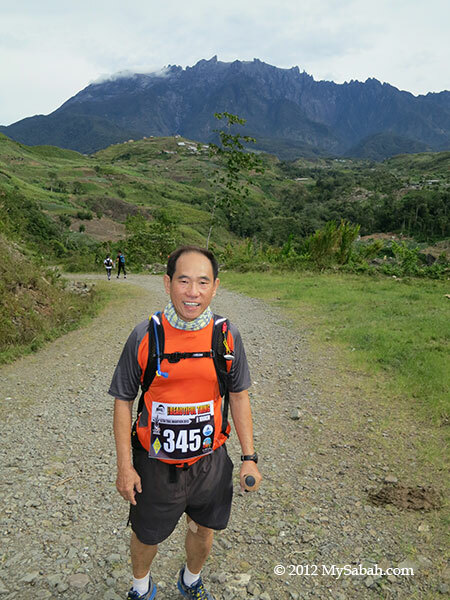 It’s probably my boldest, but right decision to participate in 50 KM Ultra Trail Run of The Most Beautiful Thing (TMBT) in Kundasang on 15 Sep, a marathon that most people think is for masochists only. 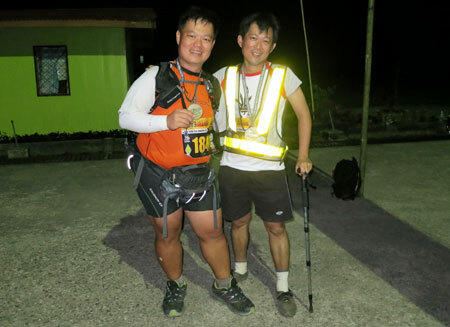 Unlike ordinary marathon, which is carried out on nice road and constant environment, ultra trail runners are exposed to various adverse factors such as extreme cold/heat, challenging terrain and uneven road surface, thereby making the race more difficult. Pic: group photo with runner friends in the briefing the day before the race. It’s me at the left. 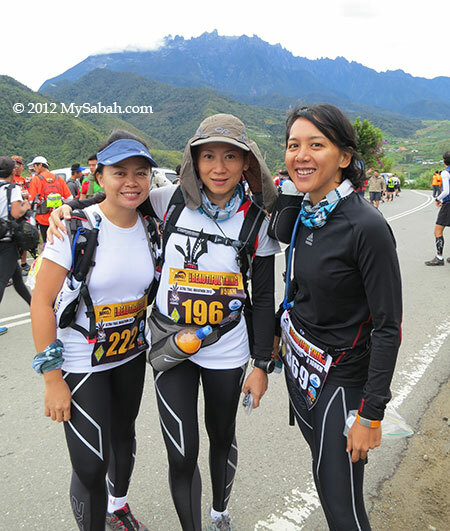 Pic: lady runners can’t wait to start the grueling run of 50 KM / 100 KM. From the left: Velerie, Georgina and Hana. What is more beautiful than being fit? As Sabah is at the “tail” of approaching Philippines typhoon, it rained heavily in the previous night. It’s a windy, cloudy and chilling morning but perfect as a race day. 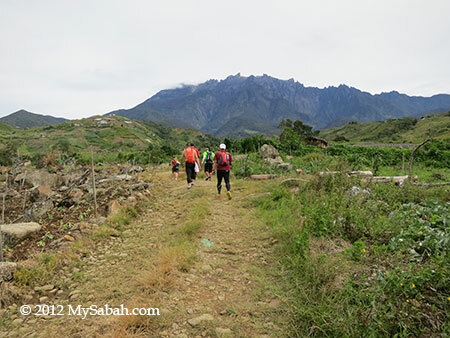 The high-spirited runners gather at an abandoned soccer field opposite to Kundasang War Memorial, and we started to run at 7.30am. 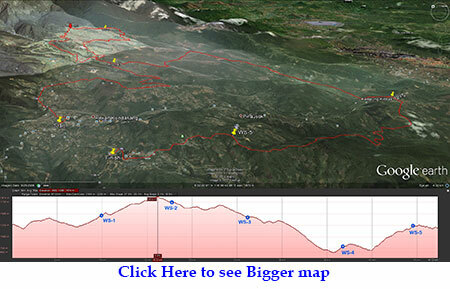 The trail map above shall give you a good idea of the 50KM-route and terrain that I’ve gone through. The 1st KM is downhill paved road, a very relaxing start. Most runners are smart not to run at this point. Soon we come to a steep slope where I sweat profusely before 3rd KM. “So tiring.. Can I make it?” I already worry in early stage. Luckily, we reach a flat gravel road and my “engine” starts to warm-up. Pic: a nice runner I meet along the way. Later I know from the organizer that he is Kevin Loh. He suffers a terrible back spasm later, so painful that he can’t stand straight. 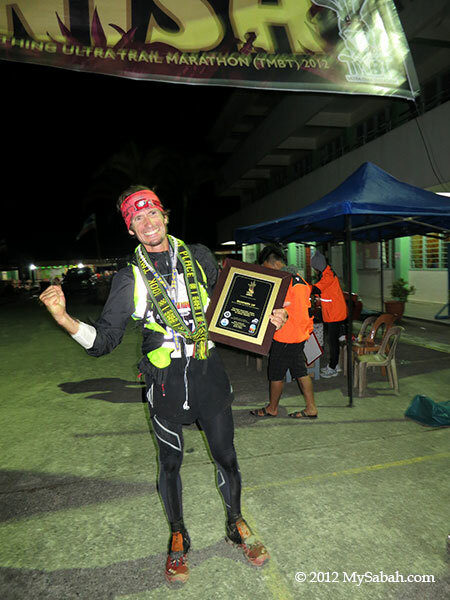 He struggles for 50% of the race course and manages to complete his 100KM before cut off time. Such strong persistence is what we call the spirit of true athlete! Double Thumb-up! The scenery is beautiful along the way, and I can’t help to stop occasionally to take snapshots. The weather is great, so is the mountain view, and I see the majestic Mt. 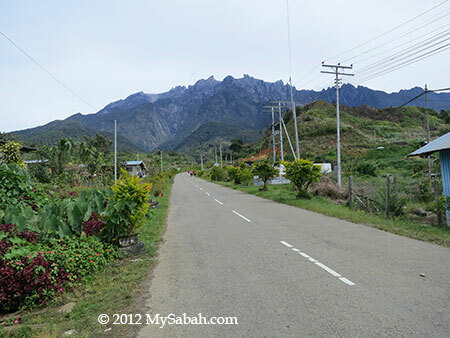 Kinabalu up-close half of the time. 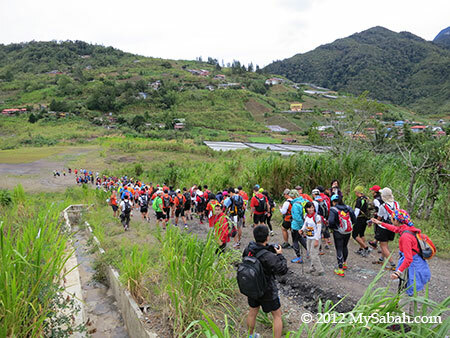 The reason they name this race as The Most Beautiful Thing (TMBT) is because the runners will see beautiful people, villages, forest, farm, garden, mountain, etc. during the marathon. I wish to photograph all of them but too bad I’m in a hurry and later so tired to move even my fingers. Stopping too often will affect my stamina too. 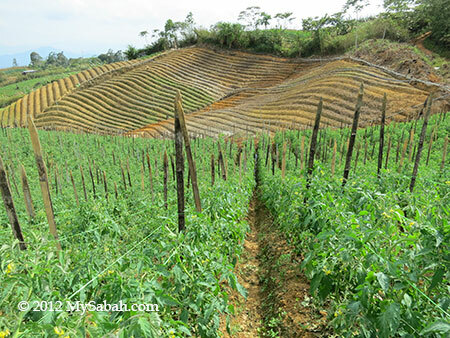 Part of our trail is next to vegetables plantation. 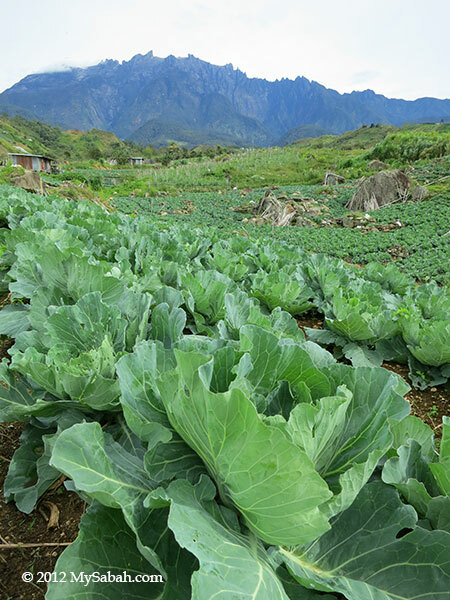 The villagers and farmers are very friendly and very generous for their smiles. I wave back countless time to the local people and children. I love everything I see, from the picturesque village farm, to the cute puppies and goats. 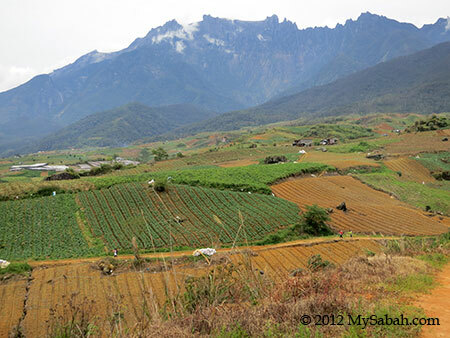 I’ve been consuming vegetables from Kundasang, but that’s the first time I see the plantation. 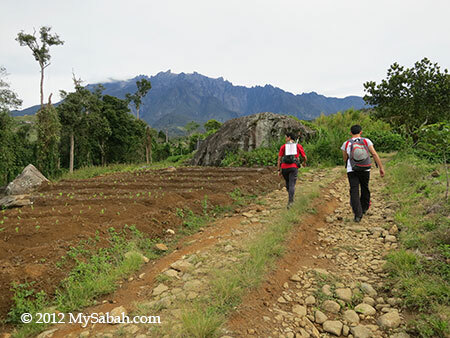 FYI, due to landslide in the original route at Kiau Village (Kota Belud), the organizer changes the route to Kundasang this year. Fortunately, the countryside road here is quite flat and the soil path is soft, so my legs can rest a bit. However, I still have to maintain a fast pace in order to finish my 50 KM run within 15 hours (cut off time). 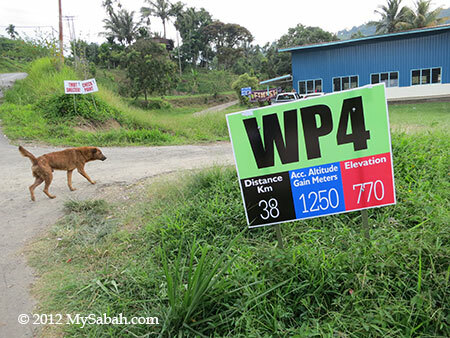 For 50 KM race course, there are 5 Water Stations (WS), which is about 10 KM apart and where we can refill our water. It is like taking me a century to reach the 1st Water Station at 10th KM, 4 more to go… The sunlight is getting harsh, so I apply sun-block lotion to prevent sunburn. After this, it’s a long and steep paved road, even cars find it difficult to speed. I felt so heavy walking on it. Pic: a pine tree corridor. 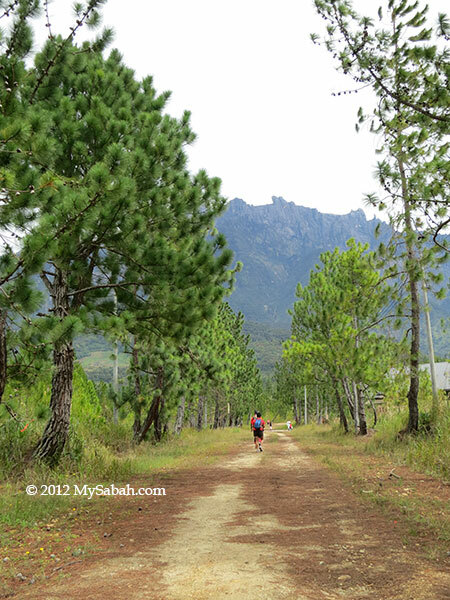 Some runners still have the energy to collect and carry the pine fruits here. 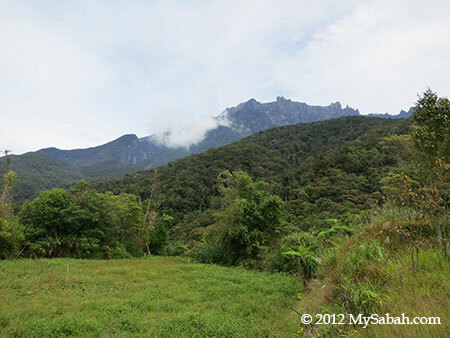 Though most forest in Kundasang is clear for agriculture, the forest reserve of Kinabalu Park is still intact, as witnessed in photo above. 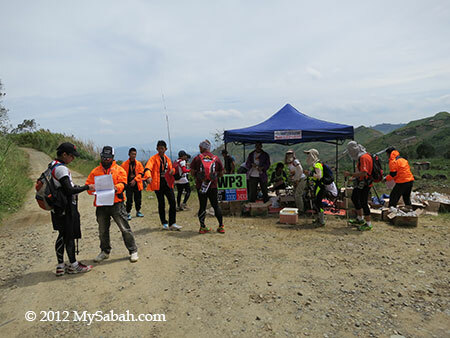 Pic: the 2nd Water Station & Check Point at 18th KM. I had power bar and drink water mixed with rehydration salt here. I feel energetic again in minutes and move on. After 2nd check point, I’m walking on open gravel road. Without any tree around acting as windshield, the wind is so strong. 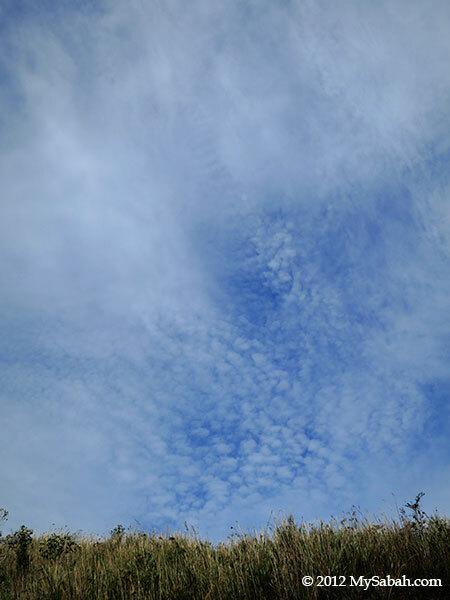 Furthermore, the wind works against me by blowing dust toward my face, causing me to slow down. 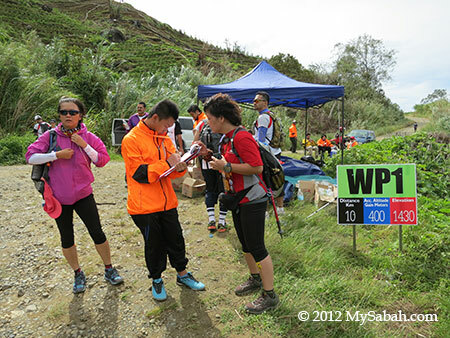 Finally, I reach the 27th KM Check Point & Water Station. 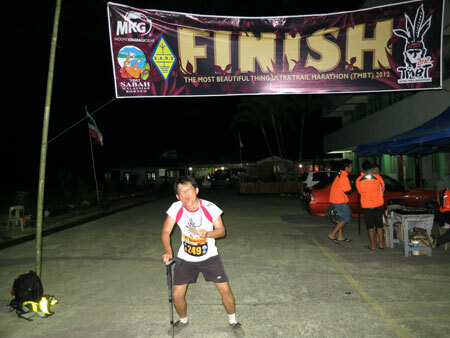 50KM runners must complete 27 KM within 7.5 hours to be qualified. I sign-in there at 1:50PM, before the cut-off time at 3pm. Feeling relief, I have my lunch break there. A runner sitting next to me can’t continue because he suffers from severe knee pain, so sad.. I only stay briefly at Water Station 3, because I have less than 5 hours of daylight for my remaining 23 KM trail. After this check point, I come to open gravel road again. 30 or more percent of my race course is on gravel road. Now the runners are split quite far apart, so I’m alone looking anxiously for next trail marker. The time is pressing so I can’t afford to lose my way. The sky is clear and the scorching sunlight shines on me, but I don’t feel warm in the cooling breeze of Kundasang highland. The long walk on descending gravel road takes its toll on my knee. I can feel my knee pain is getting intense after every Kilometer. I rely a lot on my walking pole to shift my weight to reduce the impact on my knee. My heart sinks when a village boy tells me that the next Water Station is still very far ahead, and he is right. Oh gosh, my knee is biting me.. Thanks Daniel (at left in picture above) saves me by sharing his pain killer pill. Anyway, I can’t recall how many times I swear in my mind before I see the 4th Water Station at 38th KM at last. A medic team is there to treat my blisters. Though this is the second last check point, my nightmare is far from over yet. Now fatigue is a smaller problem compared to my knee pain. I have doubt if I can make it but I don’t want to give up. Pic: me, at finishing point, after nearly 14 hours of trail run. Finally, I see the dim light of last Water Station at 45.5 KM. I’m overjoyed, not because of the free water, it means I’m less than 5 KM to the Finish Point! I’m so happy that it’s a flat road to the ending point. 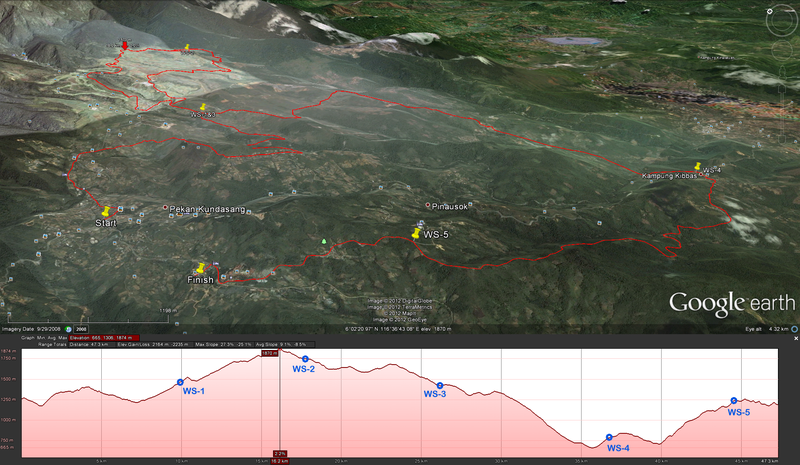 And yes, I complete my 50 KM trail at 9:08pm, before the 15-hour cut off time. I know my completion time is not impressive but I’m glad I have set a personal record for myself, with a happy soul and painful body. Pic: shortly after my arrival, Jiri Vjistein from Czech Republic finishes his 100 KM and wins 2nd place. Goodness, he is not a human! Pic: in contrast, this is how I look, due to lack of training. My face and body is covered in dust, as if I walk out of a grave. I even got a few messages from friends asking if I survive. Whatever, my family will hear me moaning while walking up and down the staircase for the next few days. 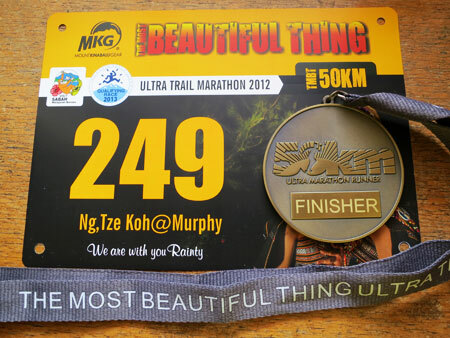 Pic: my 50 KM Finisher Medal, a reminder of my little victory and big pain. You may notice the phrase “We are with you Rainty” on the certificate. 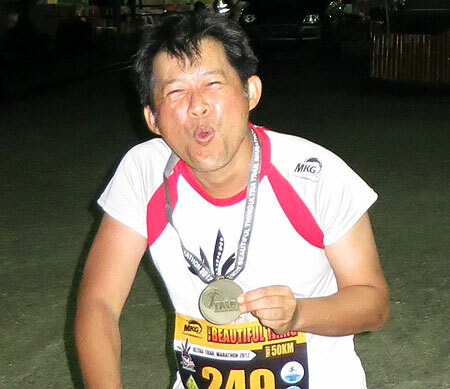 Rainty Teoh is a local runner who signed up for TMBT 50km and has been training hard for it. However, she has been diagnosed with Breast Cancer and has to withdraw from this event. Get well soon Rainty and best wishes to you. So anyone wants to test his physical and mental limit? You don’t need to wait one year for this ultra trail run. 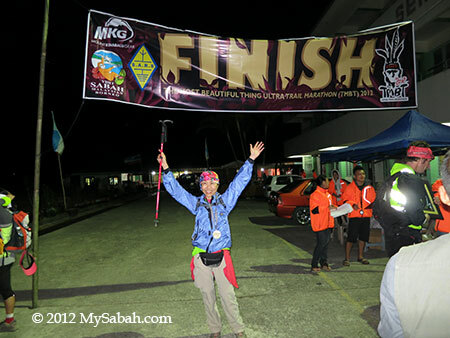 Sabah Adventure Challenge will organize another ultra run in different location in 2013. 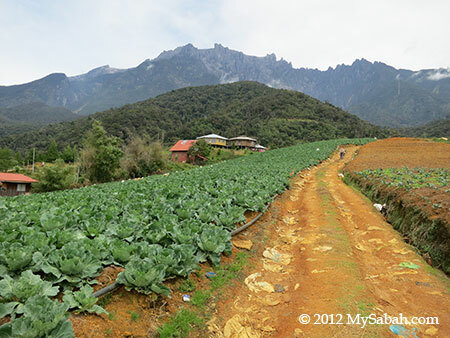 Just visit their website at www.sabahadventurechallenge.com for more info. Good Luck! For more photos and stories, you may check out their Facebook.